Dyschromia is one of the leading diagnoses in skin of color of populations. Inclusive within this broad realm of diagnoses includes physiologic pigmentation, which refers to normal biologic variations in skin coloration. In order to properly diagnose and manage disorders of pigmentation, one must be aware of the normal variations in skin pigmentation. Our review summarizes molecular mechanisms and the diverse patterns of physiologic pigmentation that may be encountered in the clinic and that are especially common in richly pigmented individuals. Progressive macular hypomelanosis (PMH) is a common and often misdiagnosed disorder characterized by numerous nummular, coalescing hypopigmented macules on the trunk of adolescents, and young adults. It was originally described in patients with Fitzpatrick skin types V-VI from tropical countries, but is now understood to have a worldwide distribution in a variety of skin types. The pathogenesis of PMH is unknown, but is thought to involve Propionibacterium acnes, which has been found in abundance in the pilosebaceous units of lesional skin. Biopsies of lesions demonstrate normal architecture of epidermis and dermis, but exhibit decreased melanin content. It is important to note that this is different from vitiligo, which has a total absence of melanin. 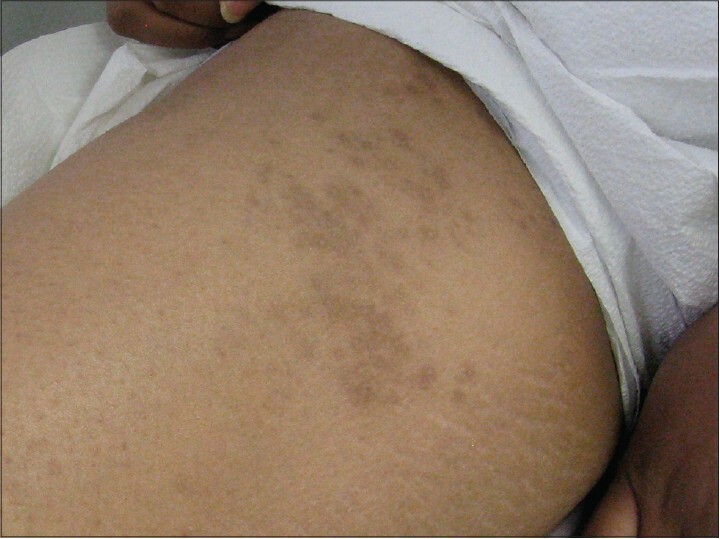 Many patients with PMH often times go misdiagnosed for tinea (pityriasis) versicolor, postinflammatory hypopigmentation, and other dyschromias. Topical antifungal and corticosteroid therapy have proven ineffective in PMH, but successes have been reported with topical and systemic antibacterial treatment modalities and even phototherapy. Given the increasing prevalence of patients with skin of color, it is important to better understand the nature of this condition, along with its diagnosis, management, and treatment. Nevus depigmentosus is a congenital disorder of pigmentation which occurs in all sexes and races. It commonly presents in childhood and is mostly nonprogressive. It is a form of cutaneous mosaicism with functionally defective melanocytes and abnormal melanosomes. 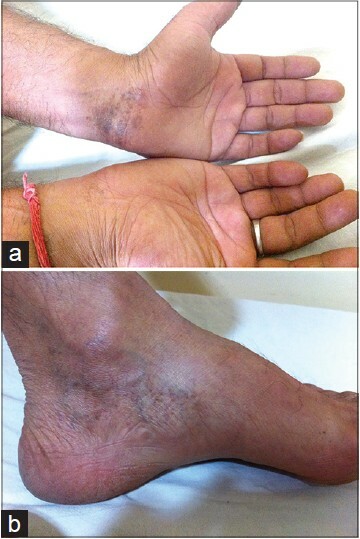 Localized solitary lesions need to be differentiated from conditions like nevus anemicus, ash leaf macule, vitiligo, etc., and generalized lesions from hypomelanosis of Ito. Treatment is usually not required although cosmetic camouflage, phototherapy, grafting, and other modalities may be tried. Postinflammatory hyperpigmentation (PIH) is a common pigmentary disorder that is distressing to patients, particularly those with skin of color, and can be very difficult to treat. Part of this difficulty arises from the dermal melanosis in addition to the epidermal hyperpigmentation. This article reviews the mechanisms that induce the hyperpigmentation including inflammatory mediators such as metabolites of arachidonic acid and reactive oxygen species (ROS) and how these may influence prevention and treatment strategies. Treating the inflammatory cause and sun protecting are crucial to effective therapy. Although common, few studies have been done focusing on prevention and treatment of this disease. Topical therapies are the mainstay of treatment for PIH, but have shown poor efficacy for the dermal hyperpigmentation component. Hydroquinone in combination with topical steroids, retinoids, glycolic acid, and lactic acid have been augmented with numerous emerging natural therapies such as kojic acid, arbutin, ascorbic acid, soy, and niacinamide. 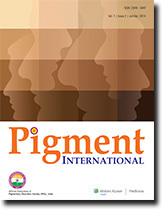 Although efficacious for hyperpigmentation, most of the natural therapies have not been studied specifically for PIH. Salicylic acid and glycolic acid chemical peels, as well as the quality-switched (QS) neodymium-doped yttrium aluminum garnet (Nd: YAG), QS Ruby, 1550 nm erbium fiber fractional thermolysis, and 1927 nm fractional thulium fiber lasers have shown good efficacy for the treatment of facial hyperpigmentation. Melasma is one of the most common pigmentary disorders worldwide with a still unresolved pathogenesis and treatment continues to be challenging. Increased sun exposure and genetic factors are considered the two most important etiological factors. Estrogens, progesterones and increased melanocyte stimulating hormone are also involved. Melasma treatment can be very frustrating as many modalities can turn out to be ineffective. Dermal and mixed variants are quite resistant to therapy. Most patients seek medical help much after the onset of the condition, making treatment even more difficult. Sunscreens and topical depigmenting agents remain mainstay of therapy. Chemical peels and light sources are beneficial as adjuncts. There have been numerous advances in the understanding and management of melasma. 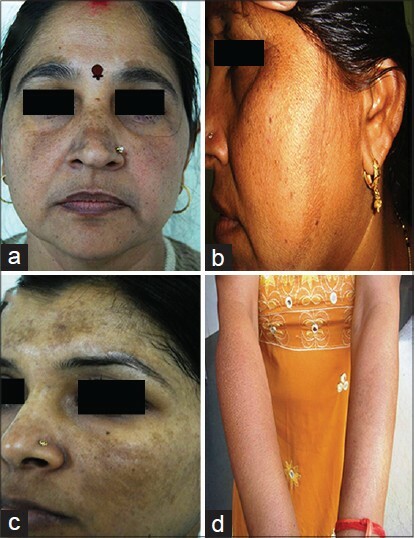 This review attempts to look at these newer vistas in melasma. Literature search for the review was done from PubMed, the Cochrane Library, MEDLINE and Embase using the key word "melisma," "melasma pathogenesis" and "melasma treatment." Diseases affecting the skin are visible to others; therefore, patients with skin diseases not only cope with the effect of the disease, but also with the reaction of people to their disease. Skin color plays an important role in an individual's perception of health, desirability, worth and wealth. Vitiligo presents as milky-white patches in the skin and/or mucosae which can result in psychosocial distress and social stigmatization. Vitiligo has a profound impact on the quality of life (QoL) of the patient. Vitiligo affects emotional, physical, social, psychological and occupational aspects of the QoL of an individual. An empathetic and supportive doctor-patient interaction, information regarding vitiligo, prompt treatment, good social support, psychotherapeutic interventions or psychotropic therapy can help the patient to live with their disease, and to manage the associated psychosocial and psychiatric comorbidity. 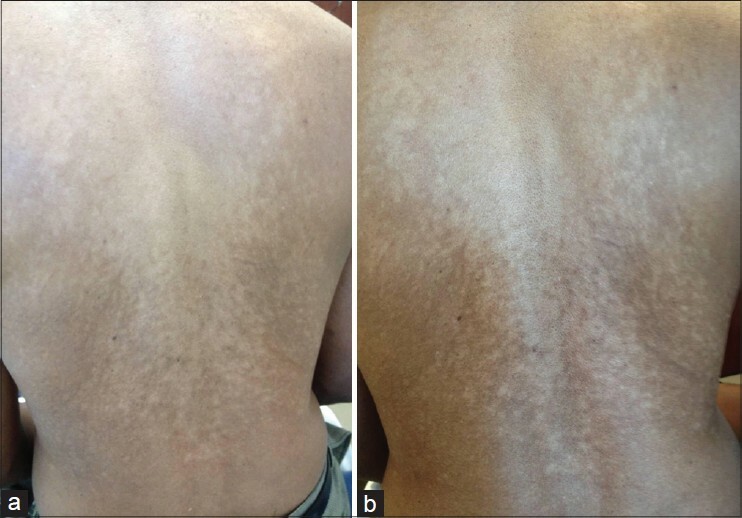 Background: Lichen planus pigmentosus (LPP) is a relatively common pigmentary dermatosis which commonly presents as brownish or slate grey patches in diffuse, reticular and blotchy pattern. Recently, linear, flexural, and zosteriform LPP have been described. Methods: The present study was aimed to study the epidemiologic profile of LPP with a special focus on the atypical variants. In this retrospective study, case records of patients diagnosed clinically and/or histopathologically as LPP during the time period from January 2009 to December 2013 were analyzed. Results: Case records of 76 patients were analyzed. The mean age and mean duration of disease were 37.6 years and 3.5 years, respectively, with M:F = 1:2.5. The diffuse pattern of LPP was the most common in 38 (50%) patients followed by reticular in 15 (19.7%), blotchy in 12 (15.7%), and perifollicular in 3 (3.9%) patients. Five (6.6) temporally correlated the onset of LPP with the cosmetic use. The atypical variants included segmental LPP in 3 (3.9%) patients, linear LPP in 3 (3.9%), and flexural in 2 (2.6%) patients. 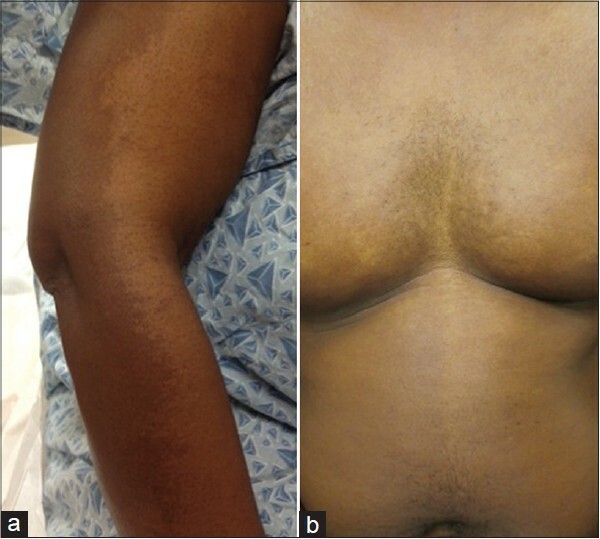 Among three patients with segmental LPP, one had bilateral LPP over breast, one had unilateral segmental LPP, and third had co-localization of segmental LPP and vitiligo. Histopathologic changes included focal basal cell degeneration with sparse upper dermal interface dermatitis along with melanophages in the upper dermis. All patients were treated with mid-potent topical corticosteroids and/or topical calcineurin inhibitors with poor response to therapy. Conclusions: The atypical and localized variants of LPP are not uncommon and like classic LPP respond poorly to treatment. 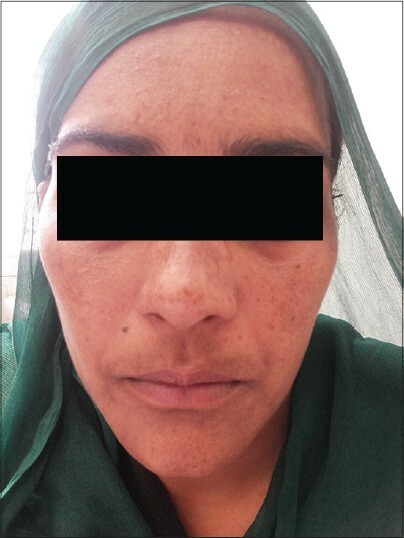 Background: Melasma is a common, acquired and symmetrical hypermelanosis characterized by more/less dark brownish macules, with an irregular contour, but clear limits, on photoexposed sites. The pathogenesis is unknown, but several clinical patterns and etiological factors have been implicated. Aims: Our present study aims to elucidate the epidemiology, clinical patterns and etiological factors in the causation of melasma in North Indians. Methods: A total of 200 consecutive patients attending the out-patient clinic from September 2013 to February 2104 with the clinical diagnosis of melasma were enrolled for the study. Photographic record was kept to study the clinical patterns. Results: The mean age of patients with melasma was 32.9 years, ranging from 18 to 60 years. Female patients out-numbered male patients, and ratio of female to male patients was 6.14:1. Patients sought medical treatment on an average of 1.79 years after appearance of melasma. 48.84% of female patients and 78.57% of males reported exacerbation with sun exposure. 36.4% of the females reported onset of melasma during pregnancy. Family history was observed in 29.07% of our female patients and 14.28% of males. History of use of mustard oil either for massage or for cooking was given by 54.07% of females and 32.14% of males, while 45.35% of females and 32.14% of males used topical corticosteroids or over-the-counter products for the treatment of melasma. Centro-facial was the most common pattern observed in 76.74% of the female patients while the malar pattern was seen in 85.71% of males. Other patterns we observed were mandibular (3.5%), lateral cheek (1.5%) and brachial (1%). Conclusion: The exact pathogenesis of melasma is unknown. Here in we have tried to elucidate the epidemiology, clinical patterns, and etiological factors in the causation of this pigmentary imperfection. 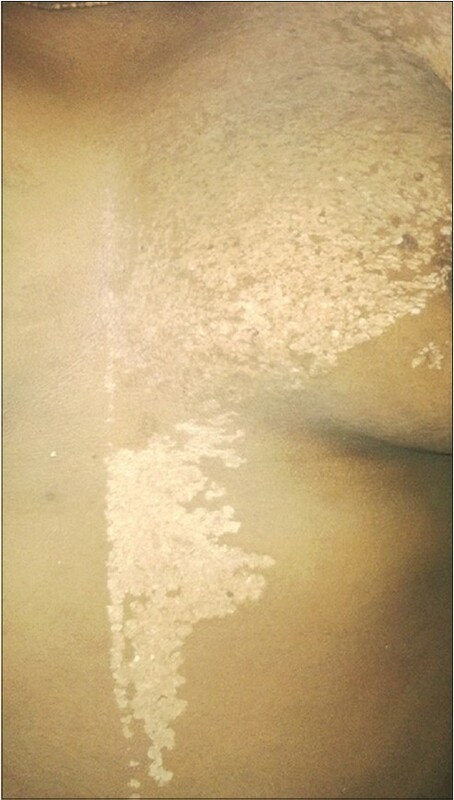 We report a case of lichen planus pigmentosus (LPP) that developed in a linear pattern, that too over nonsun-exposed areas. 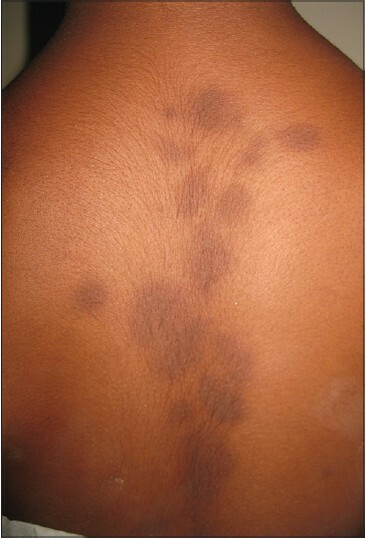 The patient presented with linear dark brown macules and patches on the back in the midline. Skin biopsy showed features consistent with a diagnosis of LPP. LPP should be considered in the clinical differentials of linear hyperpigmented skin lesions. Laugier– Hunziker syndrome (LHS) is a rare benign acquired disorder that is characterized by hyperpigmented macules of the oral cavity, lips and tips of the fingers and toes, often associated with longitudinal melanonychia. The case discussed here is a 50-year-old woman with clinical and histopathological features suggestive of LHS. We also elicit the various other causes of a similar presentation.